Tanner Glass (15) of the Rangers fighting for the puck near the Islanders’ goal. An early December game between the Rangers and the Islanders in Brooklyn on Wednesday had the buildup of a playoff clash. 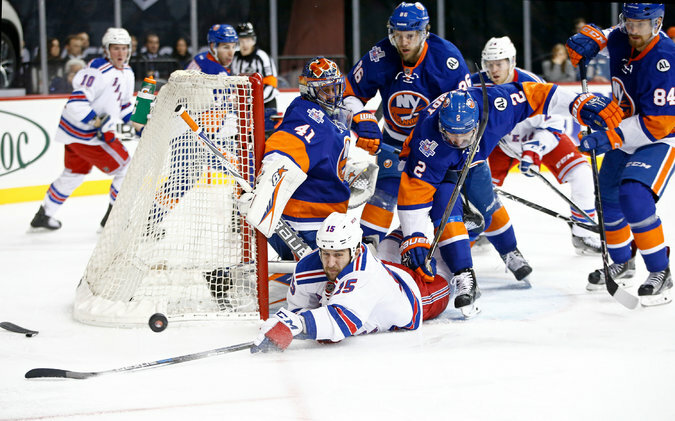 And the Islanders’ taut, 2-1 shootout win had all the tension that fans could have envisioned. “The fans were great; the atmosphere was great; that was the best all year,” said Islanders goaltender Jaroslav Halak, who made 33 saves and blanked the Rangers in the shootout after his teammate Kyle Okposo scored against Henrik Lundqvist. For the Rangers, many of whom live in Manhattan — closer to Barclays Center than their Islanders counterparts living on Long Island — the game had a peculiar feel, starting with the optional morning skate. Rangers Coach Alain Vigneault generated a few chuckles when he answered a question about what it was like to travel for a road game so close to Madison Square Garden.